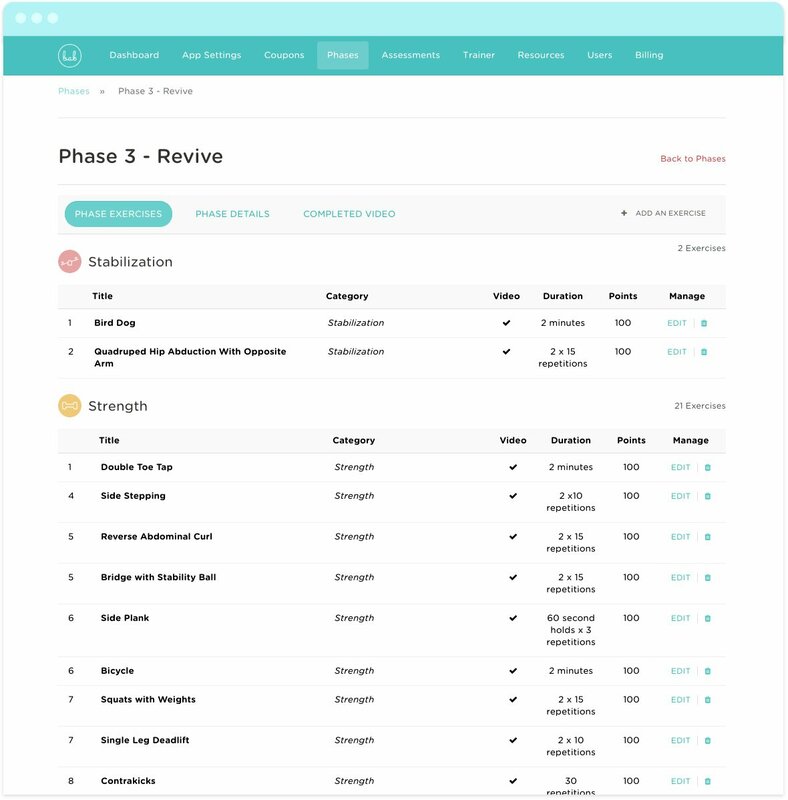 Back After Baby - Built by Flywheel Co.
We teamed up with the owners of Back After Baby to build a custom web-based application for their 3-phase postpartum rehabilitation program. Working with Back After Baby, we built a powerful brand identity that represents their business. From there we spent considerable time planning and learning about their program to carefully map out the application architecture and user experience. With their help we were able to take the program from an idea to a fully realized application. The Back After Baby program's target market is new mothers interested in postpartum rehabilitation. BAB needed a clean, soft, and approachable mark that communicates the three phases of their program: Relearn, Restore, and Revive. 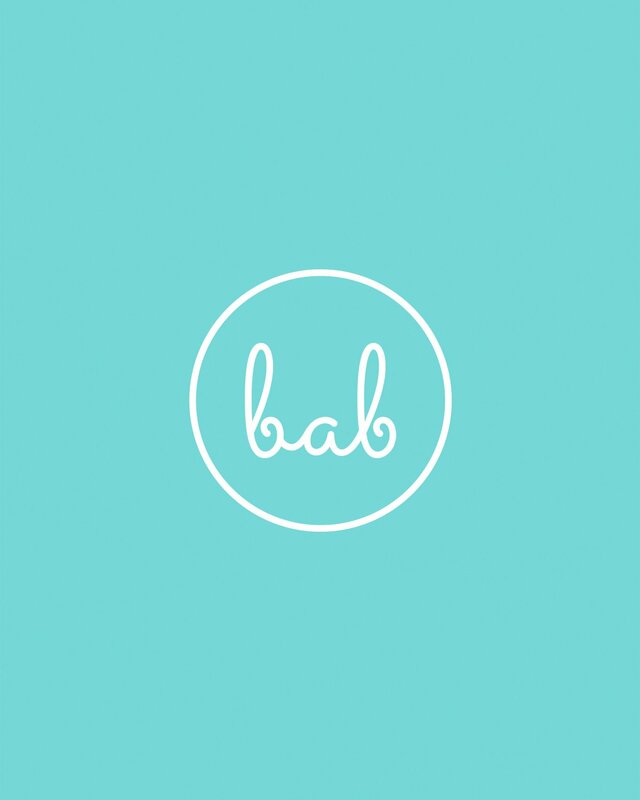 Soft colors were chosen to compliment the curvy nature of the circular "bab" mark. We needed two sets of icons for the Back After Baby program. One set of icons to let users know what Phase of the program they are in and another set to communicate the different category each exercise falls into (Neuromuscular Re-education, Stabilization, Stretching, and Strength). 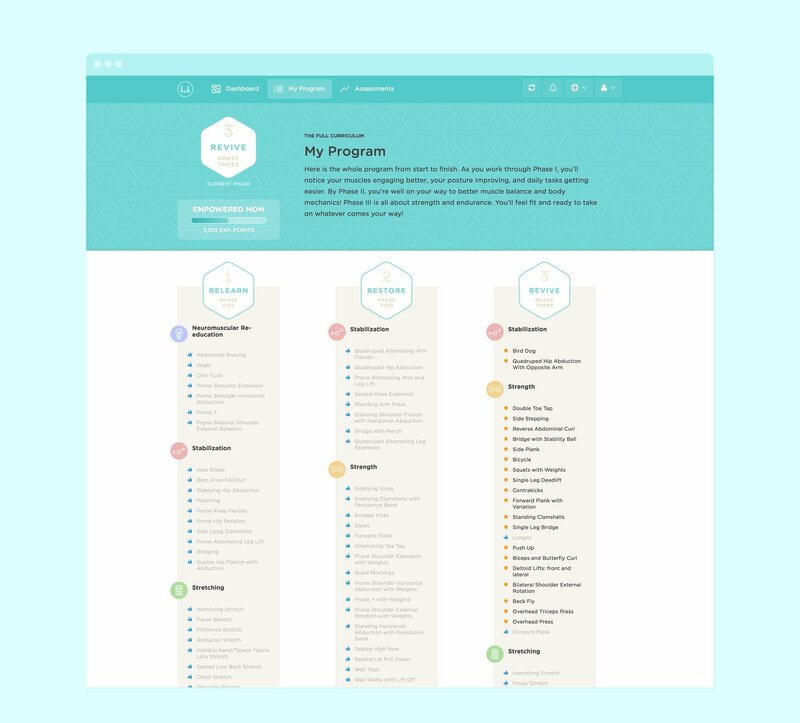 Care was put into creating a color scheme for the category icons that fit nicely into the overall brand color scheme of teal, dark grey, and cream. This web application was a lot of fun to plan, design, and build. Every aspect of the application was carefully thought out. New users are shown a tour that walks them through the program, familiarizing them with the various aspects of the system. 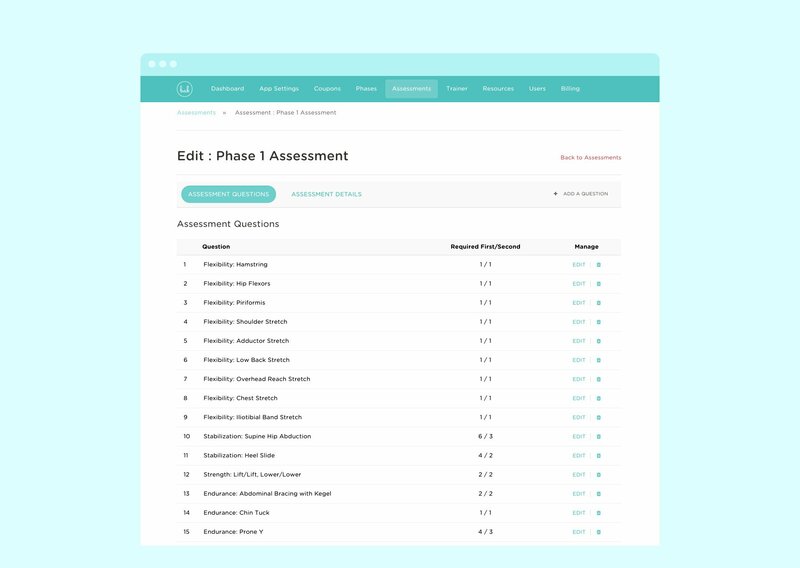 The first thing users do is take an assessment to determine their baseline physical capabilities. Based on their answers, the software assigns various exercises with videos to walk them through proper body position and technique to make improvements where they most need it. As the user progresses through the program the three phases unlock, build on each other, and increase in difficulty as progress is made. All activity in the system is logged and time-stamped and users can mark exercises as a "favorite" to come back and revisit later. All the while, users accumulate points and "level up" to motivate them as they make their way through the program. Through various stages of the program trainer notifications are used to encourage the user and keep the user interface fresh and active. 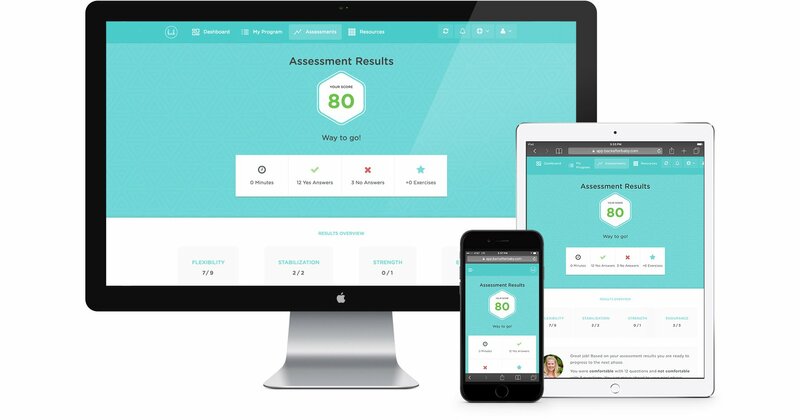 Each program is built specifically for each user based on their assessment scores. We wanted to provide the Back After Baby trainers with the ability to encourage moms as they continue their progress like a real-life trainer would. We knew that building out an administration system that made it easy to maintain was going to be important. Giving the Back After Baby trainers the keys to manage all of the content in their program was something we had to get right. It's not just the physical program, though... it is the application as a whole. Billing, user management, downloadable resources, trainer messages, coupons and more needed to be built to give the owners full control of the entire system. Our goal was to build a beautiful website that functioned well on all devices and screen sizes. The website explains the benefits of the Back After Baby system in a way that's easy to navigate and easy to look at. It prompts visitors to sign up for the program and provides a simple account creation process. What Back After Baby has to say. Flywheel met all of our expectations and more! We couldn’t be happier with the process and the results. From logo design and branding to website and application development, these guys are the BEST at turning a vision into a reality!